European Union condemns rocket fire from Gaza and expresses concern over the civilian casualties in Israel’s airstrikes. The European Union (EU) on Tuesday strongly condemned the rocket fire from Gaza on southern Israel, and at the same time also expressed concern over the number of civilian casualties in Israel’s airstrikes on Gaza, part of the counterterrorism Operation Protective Edge. 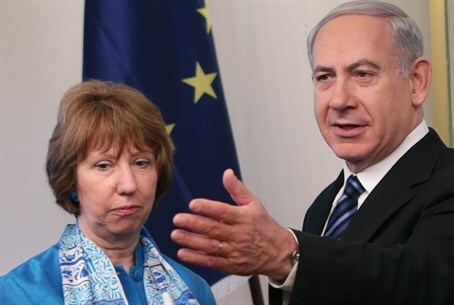 "We are following with grave concern the rapidly deteriorating situation in the South of Israel and the Gaza Strip,” said a statement from the EU’s high representatives for foreign affairs, Catherine Ashton. The EU strongly condemns the indiscriminate fire into Israel by militant groups in the Gaza Strip. The EU deplores the growing number of civilian casualties, reportedly among them children, caused by Israeli retaliatory fire. The safety and security of all civilians must be of paramount importance,” added the statement. “The EU calls on all sides to exercise maximum restraint to avoid casualties and re-establish calm. To this end the EU calls on parties in the region to do their utmost to achieve an immediate ceasefire." The statement came as Hamas terrorists continued to fire rockets towards Israel and even extended the range of the rockets. The latest salvo of rockets on Tuesday evening hit Jerusalem, Tel Aviv and as far as Hadera, which is located 45 kilometers (28 miles) north of Tel Aviv and south of Haifa. Hadera is the furthest point to date that a Gaza rocket has reached. Earlier on Tuesday, Prime Minister Binyamin Netanyahu pointed out the difference between the way Hamas operates and the way Israel operates, following an incident in which several Palestinians were killed while being used as human shields by terrorists.